Gray, TN, used to be called “Gray Station”. There was a train station right about where the big telemarketing building is now. 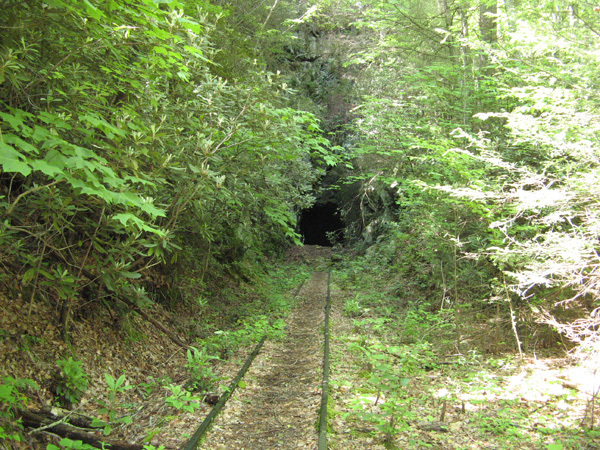 Just to the east of that location is the 41′ or so narrow ridge that the railroad had to tunnel through to maintain grade. 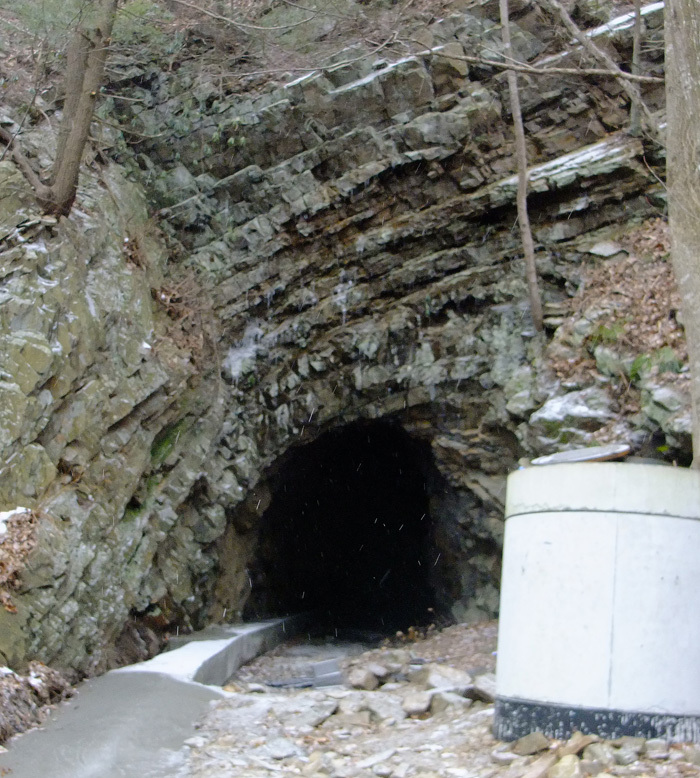 Thus: what is known now as Free Hill tunnel. It’s a 472′ jobbie that quite a few people who work and live around the area don’t even know is there (and they probably don’t care, either). 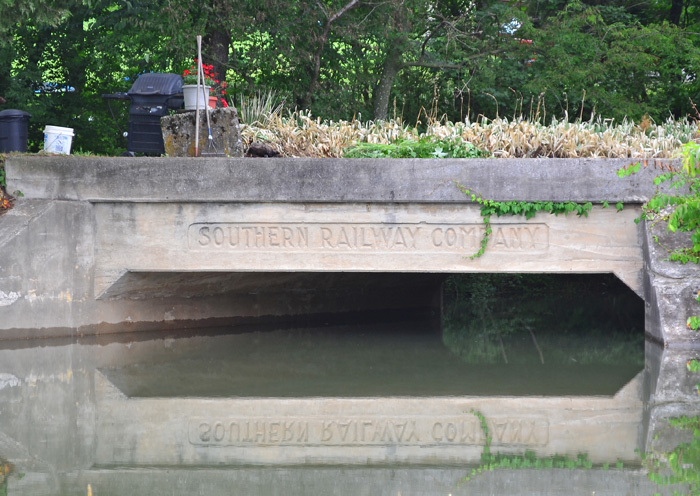 There are also two single-lane concrete railroad overpasses in the area, indicating that there were extant roads in the early 1920s (they also carry 1927 dates). But they didn’t carry a lot of traffic, or cars were a heck of a lot narrower then. 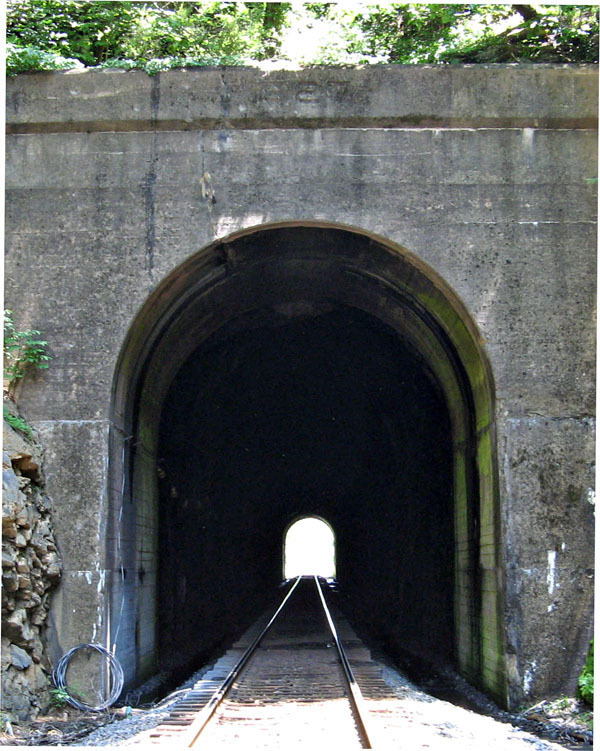 Anyway, here’s the tunnel’s EC (west) portal. 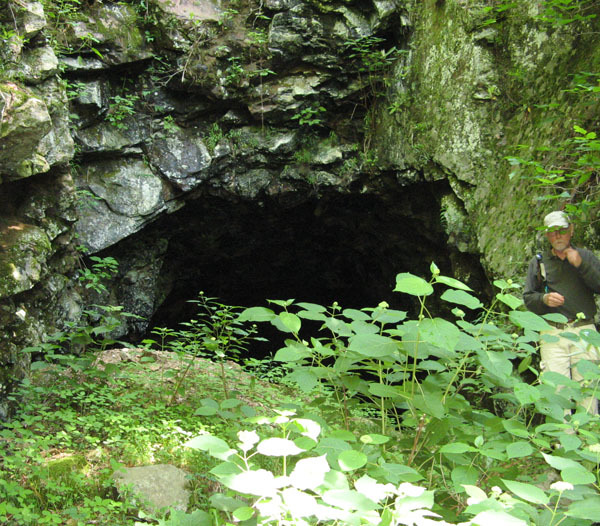 From this tunnel on, the line went on up to the fabled magnetic iron mines at Cranberry NC and, for a while, on to Boone. That’s another story, told in several locations. 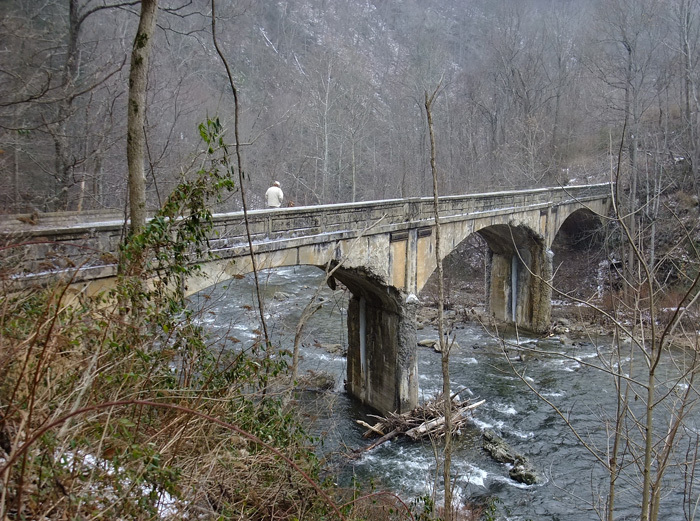 There are two bridges over the Doe in the Gorge. One still has a truss superstructure, but precious little else and the other is as described above. That’s Pardee Point…carved out in the 1880s (looking back toward the Ministry). 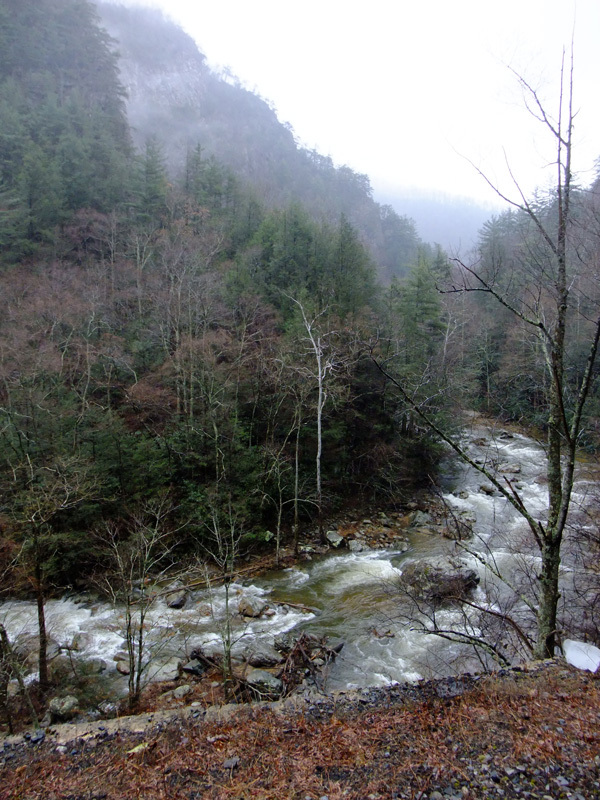 Ario Pardee was one of the owners of the ET&WNC from 1879 to 1882. Thought you’d like to know. Lots of ice…and it was slippery! But the view was, well, spectacular! 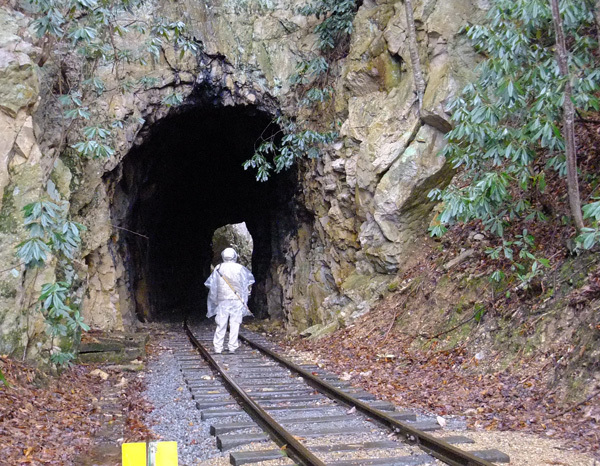 This is the second tunnel on the line heading away from Johnson City up through Doe River Gorge. It’s centered at 36.265916, -82.171331. 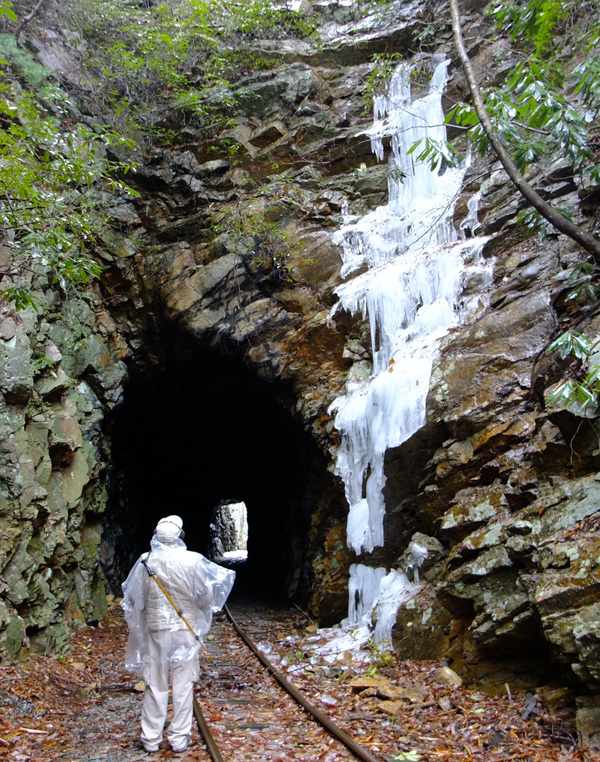 My hiking buddy, clad in plastic against the cold, January rain, is standing in the western portal. This part of the line is intermittently active during the summer for excursions from the Ministry. It’s not all that long, but it was a cloudy day and you can’t see the other portal. The concrete to the left is a conduit for telephone lines or something. The thing on the right is a container of some sort. 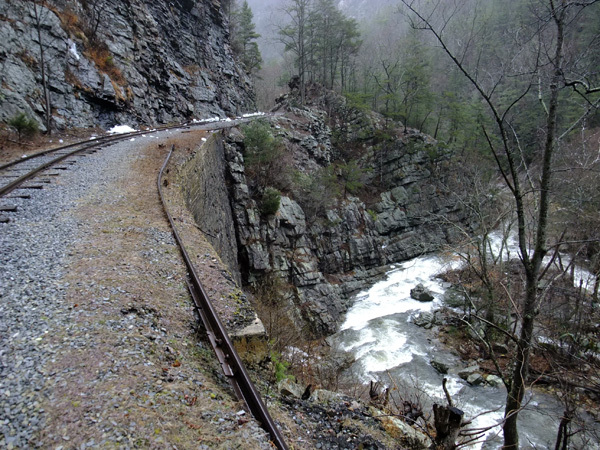 The line went through here (coming from Johnson City) and on down the Doe, up Doe River Gorge and out again near Hopson. There are several tunnels in this stretch of line. I’ve got pix. Coming up. It’s interesting. This is at 36.09553, -83.251823. “Why,” you say, “that’s on Douglas Lake!” Right again, swami. This is a long abandoned rail line (now under someone’s backyard, as you can see) that wyed off and went slightly east of another line heading in a more southerly direction. 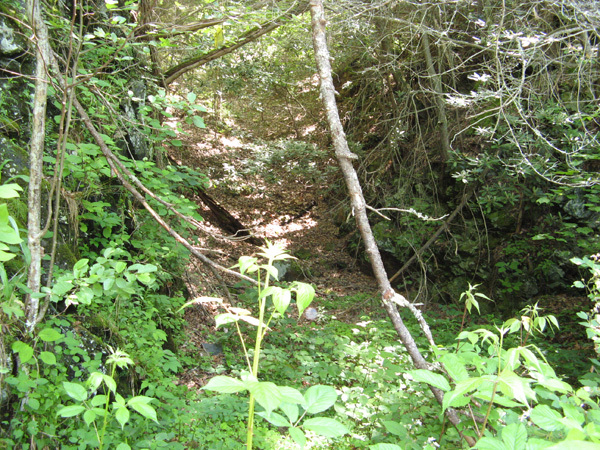 This line went across a high point in the lake (some call them islands, but they’re really just the tops of hills), past a strange structure (see it at unclebobstravels.com) and on to a now isolated and rusting through truss bridge over the French Broad River. The railway must have been mightily upset with TVA back in 1941-42, when they realized that a dam was going to be built which would impound a lake (officially a reservoir) that would cause them to do costly rearranging of their lines in the area. It annoyed many other people for other reasons, but, it was wartime, and the government needed electricity. These structures remain as reminders that this was once a fertile, much loved valley with creeks and hills and farms. Did you ever read about the lead-up activities to the Five Gorges Dam in southern China? Same thing.